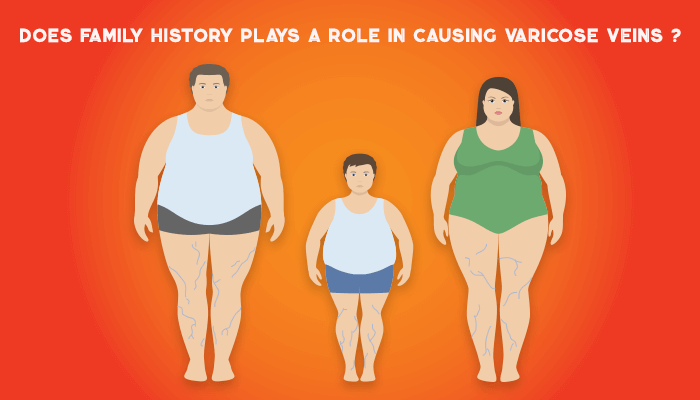 Does family history plays a role in causing varicose veins? You are here: Home / Uncategorized / Does family history plays a role in causing varicose veins? Our body has a network of blood supplying vessels that is arteries and veins. Our veins have special devices which control the blood flow known as valves. Varicose veins mainly occur when these valves in the leg veins malfunction. This causes overfilling of blood in these veins. It affects the veins of the legs and makes them enlarged. The veins often appear dark purple and are clearly visible through the skin. They may become swollen and painful. They may also cause heaviness and discomfort. Varicose veins can occur due to multiple factors and there is no single cause for it. Heredity or family history is one such factor. Heredity mainly constitutes the genetic material or genes present in each and every body cell passed on by our parents. It is any characteristic which we get from our mother, father, maternal or paternal relatives. It can be anything and everything. It can be the colour of your eyes, hair, facial features, health patterns or disease patterns. Since more than 50 years researchers have tried to find if there is any relation of heredity in causing varicose veins. These studies show that a positive family history can cause varicose veins. There are numerous other factors that can contribute to varicose veins formation. Changing lifestyle and insufficient physical activity can trigger varicose veins. Working in a sitting or a standing position for long hours. Excessive body weight or obesity is another factor which can cause varicose veins. Fattening foods have high fat and carbohydrate content and less of fibre. Intake foods coupled with a lack of physical movement result in weight gain. Excessive weight develops pressure on the veins of your legs causing difficulty in the healthy flow of blood. Wearing high heels can aggravate your varicose veins. Low heeled shoes will ensure proper circulation in leg veins and exercise your calf muscles. Frequently taking of birth control or contraceptive pills can also result into the slowing of blood flow in your blood vessels and result into varicose veins. In women, varicose veins may be aggravated during their menstrual cycle and pregnancy. Soreness, pain and swelling are common symptoms of varicose veins. They can also cause heaviness and discomfort. These veins are often seen and easily felt over the skin of legs. Cramping, itchiness and ulceration may also be experienced. What are the various treatment options for varicose veins? Surgery is the main treatment of choice for severe symptoms of varicose veins. Newer surgical techniques are minimally invasive and do not involve big surgical cuts. Various surgical techniques like sclerotherapy, radiofrequency ablation and others have been used with more or less success. Endovenous Laser Treatment is one of the newest techniques for treating varicose veins. Endovenous Laser Treatment (EVLT) is an excellent technique and has the highest success rate. Firstly, your doctor will confirm all your weak veins, using a Duplex Ultrasound Scan and will determine the best place to insert the catheter. Then, the area will be numbed using a local anaesthetic. Once the area has become numb, a small cut is made on the skin for the catheter and a guide-wire to pass. An optical laser fibre is then passed through the catheter. The affected veins are sealed with the help of laser energy. The entire procedure is painless and approximately takes an hour. After the procedure, the patients go home with a bandage and stockings placed by your surgeon. These have to be kept on for a day or two according to the surgeon’s advice. Bandages can be removed after two days of having the treatment after having a bath. Later on, stockings should be worn during the day and taken off at night. You will be given some medications to avoid pain and the risk of infection. It is essential that you complete the course of these medicines. You can start with routine activities within 2 – 3 days and resume work within a week. If varicose veins are troubling you and you are looking for a cure you should consult a vascular surgeon in your city. Dr.Abhilash Sandhyala is one of the best vascular surgeons in Hyderabad. He has successfully treated varicose veins for numerous patients. You can visit Flow Vascular clinic at H.No: 2-22-298/2/A, Sree Krishna Diagnostic Center Building, 2nd Floor, Beside Kalamandir, KPHB Main Road, Kukatpally, Hyderabad. You can also book an appointment on https://www.drabhilash.com/book-an-appointment/ or call on (+91) 99896 49498, 99590 33037. Visit https://www.drabhilash.com/ to know more about the treatment options for varicose veins.